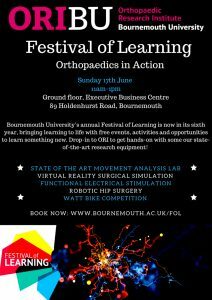 Bournemouth University’s annual Festival of Learning is now in its sixth year and runs from Saturday 16 – Wednesday 20 June, bringing learning to life with free events, activities and opportunities to learn something new. We are delighted to open the Orthopaedic Research Institute’s research laboratory as part of the event so that you can get hands-on with some of our state of the art research equipment. This year, you can try your hand at surgery with our virtual reality orthopaedic surgery simulators, see how gait analysis is conducted, test out functional electrical stimulation and learn about robotic hip surgery and how we use cycling to cure hip pain. To book your FREE ticket, please visit www.bournemouth.ac.uk/fol and search for our event. We look forward to seeing you next Sunday!